Is modern work culture is pushing otherwise good people to adopt poor management styles? From creating “growth opportunities” to taking on mentors, managers often find themselves falling into progressive traps that seem like the right thing to do, but ultimately lead employees astray. 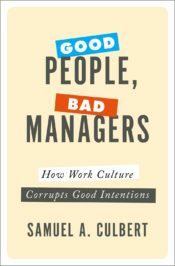 In the following excerpt from Good People, Bad Managers, Samuel A. Culbert examines the effectiveness of modern management approaches. When it’s called to their attention, most managers quickly recognize the value of new management approaches and the importance of upgrading their current style. But the work cul­ture has them fearful of taking a new direction and possibly making an image- discrediting mistake. Wading into the waters of change, but risking only one toe at a time, they seldom make sufficient headway to realize the momentum required to con­tinue progressing. In the end, they talk enthusiastically about progressive practices but don’t commit to system change. And do they ever talk. Knowing change is needed, wanting to think themselves avant-garde and progressive, they speak enlightenment words. But it’s old wine in new bottles. Passing timelines and meeting benchmarks, managers “progress- up.” They no longer make assignments, they pro­vide “growth opportunities” and “challenge a person’s poten­tial.” They don’t ask for help, they “reach out.” Their direct reports are no longer their employees, they are “business partners.” They don’t persuade and convince, they “discuss to get buy- in.” They no longer assign people to project groups, they assign them to “tiger teams” and invite them to “take journeys together.” Instead of working the data, it’s a “deep dive” and “taking analysis to the next level.” Finding someone proposing a course of action they like, they don’t just concur, now they’re “in violent agreement”— which always scares the hell out of me. When a manager wants someone’s focus, they say “let me be honest with you” and “time to open the kimono” without realizing they might be admitting that past declarations lacked truthfulness and, should I say it, a certain degree of “intimacy.” Do these words really change anything? Does anyone work “inside the box” anymore?! The field of management has gone too many years imple­menting new and progressive management practices without much fundamental progress made. Employees want managers to perform their mandated other- directed duties. They need managers to help them accomplish what they’re unable to do for themselves. But this entails managers acknowledging past insufficiencies, admitting error, and taking other directed approaches to managing. Is it that man­agers need different guidance from their higher- level managers and leaders, or is it that they’re too insecure and system suspicious to vary from what they know? Probably it’s both. The field of management has gone too many years imple­menting new and progressive management practices without much fundamental progress made. Unfortunately, when managers find the approach they’re using not working, too often their backup approach is going longer and stronger with the same approach that didn’t work. And when that doesn’t overpower employee resistance, you know what they do. It’s a route we’ve already traveled. They blame their employee for not being responsive. Responsive to what? Responsive to the self- serving, pretentious practices the work culture claims is good managerial behavior. When asking top- level managers how they got to the top, a large percentage cite someone “big” who, recognizing their potential, took them under their wing, so to speak, and set about opening doors. In today’s lexicon that’s called “being mentored.” But I don’t find mentoring a company plus. A men­tor is someone playing favorites, short- circuiting the system, and ensuring preferential treatment at the expense of system- wide fair play. Needless to say, mentors don’t think what they’re doing is negative. In their minds they’re practicing good management, doing what’s objectively right for the company. They’re cul­tivating talent, keeping people challenged, and fast- tracking “high performers” to ensure the company doesn’t lose them. It’s as if what they are doing is part of some grand retention strategy. Well, as much as I hate to rain on anyone’s happiness parade, playing favorites by mentoring is not the good man­agement development system companies should be shooting for. Good management is not about mentoring one individual at a time. It’s about fixing the system so that everyone can be their best and help the company, and creating the circum­stances for individuals to realize their ambitions and dreams. Managing in today’s work culture is fraught with too many demands for managers to assume a more other-directed focus and mentality. To do so, managers would have to put self- pursuits on hold, drop the pretense of objectivity, and work collaboratively with cohorts to identify and remove obstacles to employee effectiveness companywide. Other- directed man­agement requires providing employees the assurances needed to feel safe speaking their minds. Give employees a voice and managers will finally have the data they now lack for facing up to their mistakes and revising the erroneous reasoning that led to their making them. The way things are going now, what I’m talking about appears light- years away. Under what circumstances can employees and cohorts expect to get the type of managerial good behavior they need? It’s obvious; the culture has to change. Featured image credit: conference room table office by Free-Photos. Public domain via Pixabay. Samuel A. Culbert is an award-winning author, researcher, and professor at UCLA's Anderson School of Management. His laboratory is the world of work where he puts conventional managerial assumptions under a microscope to uncover and replace dysfunctional practices. Widely recognized as a candid speaking expert and theoretician, he is the author of Get Rid of the Performance Review and Beyond Bullsh*t. Culbert is the winner of a McKinsey Award for an article published in the Harvard Business Review, is a frequent contributor to management journals, and has authored numerous chapters in leading management books. He is the author of Good People, Bad Managers: How Work Culture Corrupts Good Intentions. I’m not so sure it’s the modern work culture that is responsible for pushing otherwise good people to adopt poor management styles, but rather that the skill levels and knowledge among top management is inadequate. There are too many novices in senior positions. People are promoted or hired into higher positions without proper selection poceeses as well as failing to implement good succession and transitions plans to ensure the hired/promoted person(s) will succeed in their new role. Furthermore, I fail to see that the new managers provides so much growth opportunities but rather that they put a restrictions on growth due to incompetence and missing leadership skills. Most do not ask for help but neither reach out. Yet, I fail to see the negativity of mentoring apart from if provided by unskilled bosses. In such situations it’s damaging. But if provided by mature and seasoned professionals…mentoring should have positive effect. You say the culture has to change…but changing the culture starts from the top, in the board-rooms. It doesn’t matter how good peoples’ intention and skilles are if they lack understanding from the top.